Property 3: Relaxing Mountain Getaway With Gorgeous Mountain Views and a Hot Tub! Property 5: On the Phipps Family Farm! Snow pack is great & Crane Festival in early March! Property 6: Three stories of spacious living; Large decks! Property 14: Amazing Mountain Views with a hot tub! Property 16: Cozy 2 Bedroom + Loft Home Sits On 6 Acres. Walking Distance To The River. Property 22: On the RIVER! Great for GROUPS! Jeep rental available. Discounts for just a few! Two Story House in South Fork with Abundant Wildlife Out the Front Door! Property 24: Two Story House in South Fork with Abundant Wildlife Out the Front Door! Serene Riverfront fantastic view !! Property 26: Serene Riverfront fantastic view !! Great 5 Bedroom home with riverfront property! Just opened up for Spring Break! Property 27: Great 5 Bedroom home with riverfront property! Just opened up for Spring Break! Great cabin in the heart of town! Property 28: Great cabin in the heart of town! Luxury River Front Property, Mountain Views, Great Skiing, Gold Medal Fishing. Property 29: Luxury River Front Property, Mountain Views, Great Skiing, Gold Medal Fishing. Property 32: Beautiful Home in upscale neighborhood. Sleeps 6. Property 35: Beautiful 5 bedroom/5 bathroom home with amazing mountain views! Stunning 4BR Riverfront Home with amazing Rio Grande vistas! Property 36: Stunning 4BR Riverfront Home with amazing Rio Grande vistas! Gorgeous Newly Remodeled Log Cabin at Tiny Timbers Resort! 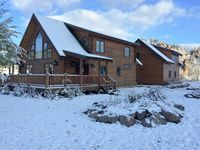 Property 40: Gorgeous Newly Remodeled Log Cabin at Tiny Timbers Resort! Property 44: Beautiful Victorian Home in the mountains. Stay in the Hipster House! Newly Updated and Available Now! Property 45: Stay in the Hipster House! Newly Updated and Available Now! New Rental Listing! Available Spring Break! Lodging Lift Tickets Packages. Property 46: New Rental Listing! Available Spring Break! Lodging Lift Tickets Packages. Property 50: 3 BEDS, 2 Baths, Garage, Panoramic Mountain Views,Pet Friendly, WI/FI, MOVIES!! We really enjoyed our stay at Belmont Del Norte! Beautiful house! Beautiful Views! The house was set up with everything we needed for our vacation to be successful. Thank you so much Stan! for letting us enjoy your Colorado Retreat.